Super Simplified Skincare … the MD Way! Figuring out what skincare products to use can be confusing. You work hard for your money, so you don’t want to waste it! You want a core skincare system that addresses multiple signs of aging, including: fine lines and wrinkles, volume loss, pigmentation, pore size, tone, texture and dehydration. Start your program with a great cleanser. Choose from the MD Purifying Cream Wash (for maximum moisture: dry skin type) or the MD Purifying Foam Wash (for gentle exfoliation: normal skin type). A good cleanser is truly the foundation for good skin. Next up? MD’s comprehensive, 3-piece anti-aging kit, formulated to address skin needs through the latest technological advancements. These full-sized, moisture-rich formulations quench and recharge the skin. After cleansing, apply each of these essential products twice daily, morning and evening. Start with three drops of the MD Stem Cell Factor 55 serum over the entire face and neck. This amazing youth activating stem cell elixir rejuvenates the skin’s natural ability to produce youthful proteins. It helps to even out skin tone; while refining overall skin texture and firmness. Follow with the MD Skin Brightening Cream. Don’t go without this secret beauty weapon for melasma, age spots, wrinkles, and pores. This potent formulation won’t cause peeling or irritation and is suitable for all skin types. It’s also paraben and hydroquinone free. Finish with the MD Ultimate Eye Cream by gently patting it around the eyes. This formula is the first ever designed to replenish the volume under the eyes—essentially “filling in” the sunken area. You’ll experience an instant lift, hydration and brightening of the area. Plus, you’ll also see it’s great for other areas that need filling, such as the cheeks, the mouth and the jowl area. With the above MD products at the core of your program, you are well on your way to perfect skin! 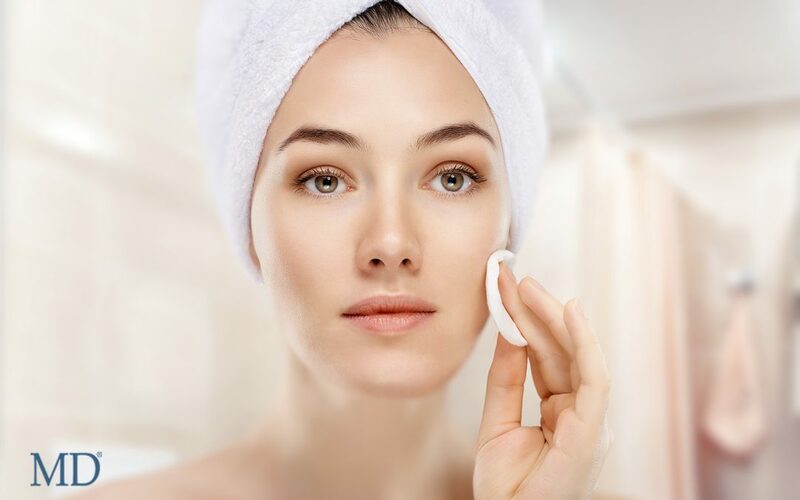 For specific skin care concerns, such as sun protection and deep exfoliation, one of MD’s trained Medical Aestheticians would be pleased to assess which additional MD products are right for you.